Local author Jan Lawson will be featured at the September 1st Off The Shelf Author Series at Crystal Books and Gifts at 439 Main Street in Downtown Grand Junction. The event is free to the public and will be from 6-7pm during the Downtown Farmers Market. Lawson has published 3 books, On the Fly, Kijik and I, Kuya Kai and a recent book of poetry, Poems to See Me Through. Adolescent fiction continues to grow as a best-selling genre. But whats the formula for keeping pubescent readers engaged in a book when theyre surrounded by a world of multimedia stimulations? Jan Lawson shares a few suggestions. Lawson has lived and taught in Texas and Colorado, but returns home to her native Alaska whenever possible. 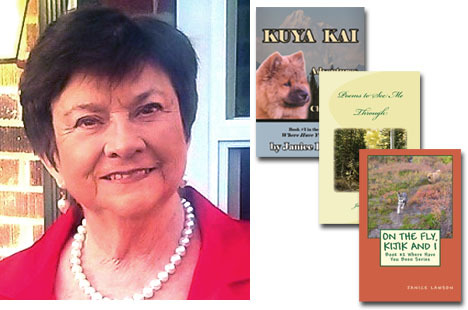 Her books and poetry reflect the nature and cultures of all the special places shes called home. She now lives in Grand Junction, Colorado, retired from teaching adolescent readers and college level writers, but she will never retire from writing. Seating for this event is limited. For information about this event and future upcoming events, go to crystalbooksandgifts,com or call 242-5181.